I'm delighted to be invited to be writing new pieces for the "Creating My Cambridge" project. One will be about the Coprolite Mines and the Dinosaur Poo 'gold rush' of the 1890s on Coldham's Common. Another will be a STEAM story about gravity and the experimental practice of Isaac Netwon. I'm looking forward to visiting Cambridge again in 2016 to collaborate with Historyworks and visit with primary children to perform some poems together! My first piece that I performed to launch 'Creating My Cambridge' is about the stone lions that sit outside the Fitzwilliam Museum which will be 200 years old in 2016. To learn more about the history behind the poem that about the lions please click here. To read the words and listen to me reading the poem about the lions please click here. So, back with the four lions. I heard about the story of them getting up at night and going to drink from the gutters. I thought it was interesting that they look as if they're asleep. Then I thought about them dreaming. What would very old lions be dreaming about? And what would they hear as they sit there, day after day, year after year, rain and sun? So that set of ideas started to mix and mingle in my mind and if you read and write poems a lot, lines from other poems come into your head as you're writing. In this case, it was almost as if other lions from other places were saying to me, 'And don't forget us!' This is good for writing poems too because, in this case, it makes the lions at the Fitzwilliam Museum become part of other lions in art and history - as if they know each other. Anyway, some people reading the poem might recognise me mentioning these lions from another poem or two. It's like a code that only the lions know! And people who write poems are often interested in taking familiar things and saying surprising, unfamiliar things about them. We do that because we're trying to see the world in a new way. So, there were times when I was writing this, I had familiar ways of writing about familiar things and it was too ordinary, so I shook it up and made it more strange. Another things that poets often try to do is not 'over-explaining' things. We try to leave things a bit mysterious, or with room for the reader to wonder why or how. Sometimes, we can't stop ourselves doing this because of course we don't have all the answers ourselves. Poetry is a good place to pose questions that we can't answer. So, for example, I got the idea that the lions would be thirsty. That's a very real feeling that humans have. But we also talk about being, say, 'thirsty' for knowledge. So we use 'thirsty' as a metaphor in everyday life. And I thought of the lions hearing so much and knowing so much of the way of the world and how their thirst would be both real and and metaphorical. So what else are they thirsty for? To tell you the truth, you would know as much about that as me. Really. And if the last words of a poem are mysterious enough, they'll encourage people to go back over a poem to find out why the poet may have written those words. Re-reading brings out all sorts of new things. I think most poets would be very pleased if they heard that the way they had written encouraged people to go back over the poem. Thanks for reading this and the poem. It has given me enormous pleasure to work with Helen Weinstein after so many years of association, and to make concrete our shared passion for disseminating our curiosity of the past, of objects, of words, and we hope that whenever you walk past a stone animal you wonder who created them, how long they've been there, and what they have witnessed and heard over the years...."
Michael Rosen is a poet, novelist, broadcaster, and journalist. 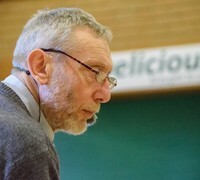 He was the the fifth British Children's Laureate from June 2007 to June 2009 and has recently been appointed as Professor of Children's Literature at Goldsmiths, University of London. His radio work includes BBC Radio 4's 'Word of Mouth' amongst other other programmes. His books include 'We're Going on a Bear Hunt', "Centrally Heated Knickers', 'Don't Put Mustard in Your Custard', Hairy Tales and Nursery Crimes', 'William Morris, Poems of Protest', 'Fluff the Farting Fish', 'Send for a Superhero', 'Aesop’s Fables', 'Wolfman', and one of his most recent is 'Alphabetical: How Every Letter Tells a Story' (John Murray, 2013). To visit Michael's website you can click here, and for a complete list of books up to and including 2016 you can click here.